This major international exhibition explores the relationship between French and British painting during the decades of High Romanticism, from 1820 to 1840. The profound engagement between these two previously unsympathetic schools of painting resulted in formal and stylistic innovations that would radically affect the course of modern art in western Europe. Following Napoleon Bonapartes defeat at Waterloo in 1815, artists and educated tourists crisscrossed the English Channel. British painters contributed regularly to the Paris art exhibitions, and travel by French artists to England and Scotland became a common alternative to studying in Italy. Anglomania was rampant in Paris, with every aspect of British culture and manners eagerly absorbed and imitated. The pictures in this exhibition have been arranged thematically, as described in the following text, to illustrate the rich tapestry of this entente cordiale. The Medusa was the flagship of a convoy carrying settlers to reestablish the French colony at Senegal. Owing to the incompetence of its inexperienced captain, it ran aground off the west coast of Africa on July 2, 1816. Two hundred and fifty passengers were placed in lifeboats; the rest boarded a makeshift raft, to be towed to safety. In their haste to get to shore, those in the boats cut the raft loose, leaving 149 men and one woman adrift. With few provisions and no navigational equipment on the raft, the situation rapidly deteriorated. An attempted mutiny decimated the ranks. By the fourth day all the survivors were practicing cannibalism. By the eighth day, only fifteen men remained. They survived another week until their rescue by the British frigate Argus. Among the survivors were the ships surgeon and an engineer. Their account of the tragedy, published in 1817, accused the French government of a cover-up. It also inspired Théodore Géricault to paint the supreme manifesto of Romanticism, The Raft of the Medusa. Géricault was already a preeminent figure in French art when he embarked on this project. But presenting a controversial topical subject, on the immense scale of 16-by-23 feet and in the style of grand history painting, was artistically and politically provocative. Not surprisingly, this painting divided critics when it was shown at the 1819 Paris Salon. 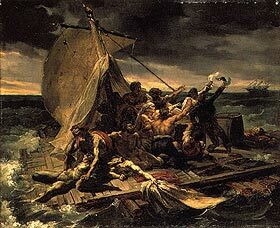 Depressed by its reception in France, Géricault accepted an invitation to exhibit the Raft in Great Britain, where the story of the infamous shipwreck had been well publicized and was seen as a vindication of British disdain for the French navy. From June to December 1820, more than forty thousand British visitors paid to see the Raft in William Bullocks Egyptian Hall, a fashionable gallery in Piccadilly, London. The exhibition was both a financial and a critical success. We can judge its effect in the present exhibition by a full-scale copy painted in 1859 by Pierre-Désiré Guillemet and Eugène Ronjat, dramatically installed as it would have been in Bullocks establishment. Géricaults rare and exquisite preparatory oil studies for the Raft offer a stunning complement, together with masterpieces by British artists that the painting inspired, including J. M. W. Turners imposing Disaster at Sea. While in London for his exhibition, Géricault wrote prophetically to his friend and fellow artist Horace Vernet: "The only thing our talent lacks is to be steeped in the English School . . . color and effect are understood and felt only here. Each school has its own character. If we were to succeed in uniting all their qualities, would we not attain perfection?"